Ladewig, J., Koch, P. and Brüstle, O. (2015). In vitro Migration Assays for Neural Stem Cells, Intermediate Neurogenic Progenitors and Immature Neurons. Bio-protocol 5(1): e1371. DOI: 10.21769/BioProtoc.1371. In the vertebrate central nervous system (CNS), different neural precursor populations such as neural stem cells (NSCs), intermediate neurogenic progenitors (INPs) and immature neurons have to migrate from their places of birth to their location of function. Coordinated migration is mediated by direct cell-cell interactions and by extracellular matrix components, chemoattractants as well as repellents. The migration potential of such populations as well as the responsiveness to chemoattractive compounds can be addressed in isolated cells using in vitro migration assays. Here we describe two migration assays, a matrigel migration assay and a Boyden chamber migration assay, which allow the in vitro assessment of neural migration under defined conditions (Ladewig, Koch and Brüstle, 2014). A matrigel matrix is a soluble basement membrane extract. The major components of matrigel matrix are collagens, laminin and proteoglycans, which provide the substrate for migrating cells. In the matrigel assay migration can be analyzed using a phase contrast microscope. The Boyden chamber assay (Richards and McCullough, 1984) is based on microchemotaxis chambers, which consist of two compartments separated by a membrane with a defined pore size. Cells can be plated in the upper compartment and allowed to migrate through the pores towards the lower compartment, in which a potential chemotactic agent is loaded. Cell migration can be analyzed following fixing and immunohistochemical staining. In principle, the described protocols should be applicable to other cell populations such as endothelial cells or cancer cells using conditions adapted to the individual needs of the specific cell type. Thaw matrigel matrix at 4 °C on ice overnight. Dilute matrigel matrix at a ratio of 1:2 in cold DMEM/F12. Note: 1 ml of matrigel will be sufficient to prepare 12 wells of a 4 well dish. Add 250 μl of the matrigel matrix mixture per well of a 4-well tissue culture dish and incubate in the cell culture incubator (at 37 °C) for at least 30 min for hardening. Note: Store pipet tips at -20 °C before using. Trypsinize cells and count them using a counting chamber. Note: At this step cell suspension can be incubated with 0.1% DNAse to avoid cell clumping. Pellet cells by centrifugation at 300 x g for 4 min. Remove supernatant and resuspend 100,000 cells/µl in cell culture media (e.g. Neuronal media containing DMEM/F12 with one vol% N2 supplement and Neurobasal with two vol% B27 supplement mixed at a 1:1 ratio). Optional: Add 5 mM Rock inhibitor for cell survival. Spot 1 µl of the cell suspension in the middle of the dish on the gel surface. Note: Specified 4 well dishes have a very slight round bottom which supports precise spotting. Incubate dishes for 10 min by carefully transferring them to the cell culture incubator until cells are attached. Carefully cover the cells with respective cell culture media and cultivate them in the cell culture incubator until analysis. Radial migration from the center of the cell clumps can be analyzed at different time points using static or live cell microscopy (see Figure 1). Place Millicell culture plate inserts into 24 well plates and coat them from both sides with poly-l-ornithine. Incubate the culture plate for at least 2 h at 37 °C (e.g. in the cell culture incubator). Wash the 24 well dish with the millicell culture plate inserts 3 times with PBS followed by coating with laminin (1:1,000 diluted in PBS). Wrap the dish with parafilm and store at least over night at 4 °C. Note: Experiments should always be performed in triplicates. Note: At this step cell suspension can be incubated with DNAse to avoid cell clumping and filtered through a nylon mesh (before counting). Pellet the cells at 300 x g for 4 min. Remove the supernatant and resuspend 1 x 106 cells/ml in neural differentiation media. Note: The media used should not contain any growth factors or cytokines. Remove the coating suspension and load the bottom well of the chamber with 400-450 µl media with or without the chemoattractant of interest (e.g. 10 ng/ml VEGF or 10 ng/ml FGF2). It is crucial that the media in the bottom well is covering the bottom side of the membrane but should not rise to the upper side. To avoid bubbles, carfully tip the pipette to the fringe of the chamber. Use respective chemoattractive-blocking agents as control (e.g. VEGF receptor 1 and VEGF receptor 2 blocking antibodies and FGF2 neutralizing antibody). Plate 100 µl of the cell suspension on the poly-l-ornithine/laminin coated membrane that separates the upper and the lower well. Note: Do not touch the filter and avoid creating bubbles. Place the chamber in the 37 °C, 5% CO2 incubator for 6-20 h. The incubation time varies considerably depending on the cell type and chemotactic factor. Fix the dish (with the millicell culture plate insert) with 4% PFA and wash twice with PBS. Stain the upper and lower side of the membrane with DAPI. Note: Check under the fluorecence microscope whether cell destribution is uniform (on both the upper and lower side of the membrane) and proceed only with those membranes. Non-uniform distribution of cells is most likely due to incomplete coating of the membrane. Take care that the membrane is not getting dry during the coating (point 1-3). Wipe off cells on the upper side of the membrane (non-migrated cells) with a cotton bud. Repeat this step at least twice. Stain the millicell culture plate inserts (in the 24 well dish) for appropiate markers (e.g. ßIII tubulin to identify neurons, nestin for neural progenitors). Cells reaching the bottom side of the membrane can be quantified under the flurecence microscope (Figure 2). Note: The millicell culture plate inserts can be placed on a glass object slide, use a drop of PBS to keep the membrane wet. Figure 2. Cell migration studied by using millicell culture plate inserts. A. Cells are plated on the membrane of the upper well. Chemoattractants can be added to the lower well. Migration of cells from the upper well through the membrane can be measured by wiping off the remaining cells from the upper side of the membrane using a cotton bud and counting the cells that reached the bottom side. Adapted from Erlandsson (2003). B. Assessing the migration of neurons within a cell mixture (containing neurons and progenitor cells) and of purified neurons. 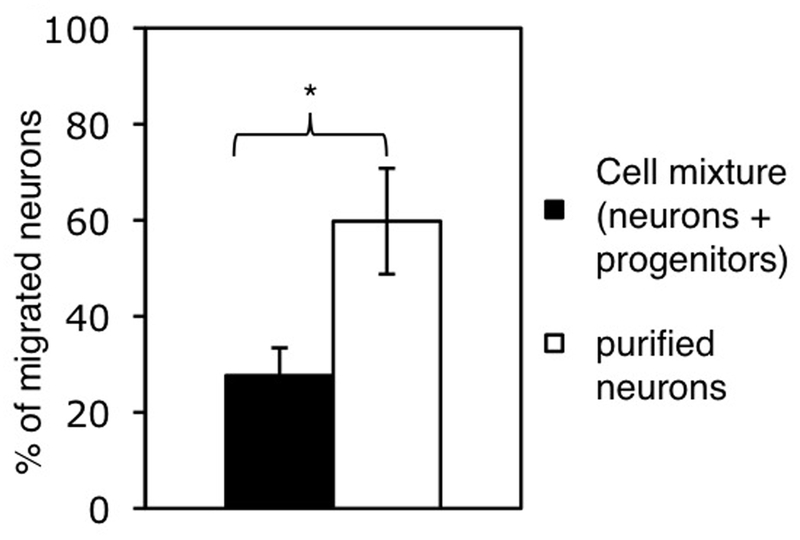 Bars represent the percentage of neurons reaching the lower side of the membrane after 20 h. Cell numbers were normalized to the number of neurons plated and shown as mean+SD (*P < 0.05). The quality of the Millicell culture plate inserts can vary, thus it is crucial to ensure that the cell destribution is uniform on both the upper and lower side of the membrane as described in point 11 of the Boyden chamber migration protocol. This work was supported by the European Union (grant 222943 Neurostemcell; LSHG-CT-2006-018739, ESTOOLS), the German Research Foundation (DFG; SFB-TR3), the Hertie Foundation and the Ministry of Innovation Science and Research of North Rhine-Westphalia (Junior Research Group, L-072.0081). Erlandsson, A. (2003). Neural Stem Cell Differentiation and Migration. Koch, P., Opitz, T., Steinbeck, J. A., Ladewig, J. and Brüstle, O. (2009). A rosette-type, self-renewing human ES cell-derived neural stem cell with potential for in vitro instruction and synaptic integration. Proc Natl Acad Sci U S A 106(9): 3225-3230. Ladewig, J., Koch, P. and Brüstle, O. (2014). Auto-attraction of neural precursors and their neuronal progeny impairs neuronal migration. Nat Neurosci 17(1): 24-26. Ladewig, J., Koch, P., Endl, E., Meiners, B., Opitz, T., Couillard-Despres, S., Aigner, L. and Brüstle, O. (2008). Lineage selection of functional and cryopreservable human embryonic stem cell-derived neurons. Stem Cells 26(7): 1705-1712. Richards, K. L. and McCullough, J. (1984). A modified microchamber method for chemotaxis and chemokinesis. Immunol Commun 13(1): 49-62. How to cite: Ladewig, J., Koch, P. and Brüstle, O. (2015). In vitro Migration Assays for Neural Stem Cells, Intermediate Neurogenic Progenitors and Immature Neurons. Bio-protocol 5(1): e1371. DOI: 10.21769/BioProtoc.1371.